Yeah, makes me think I should read it again. Aww that cover makes me think of you. Excellent book, I highly recommend. I remember reading this in high school and just being broken by it. I was a teenager when I read it too. My mother belonged to a book club. Very powerful story. I think it really gave me a better awareness of just how fortunate a life I had growing up and the ultimate price of thievery over hard work. Man, his wife suffered... and he never realized until he died how much she did to save him and their family. Of all the book covers I've seen this is the only book that I've read. 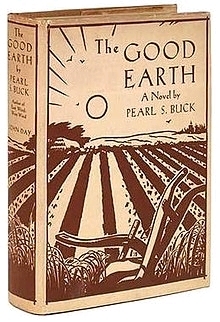 I do like Pearl Buck. I love her too. Read this when I was barely a teenager and it has stuck with me my whole life. I have the book that goes with this dust cover, but the cover is sadly misssing.